Mary Ann Varley was recognized for her community leadership in visual arts and cultural development. 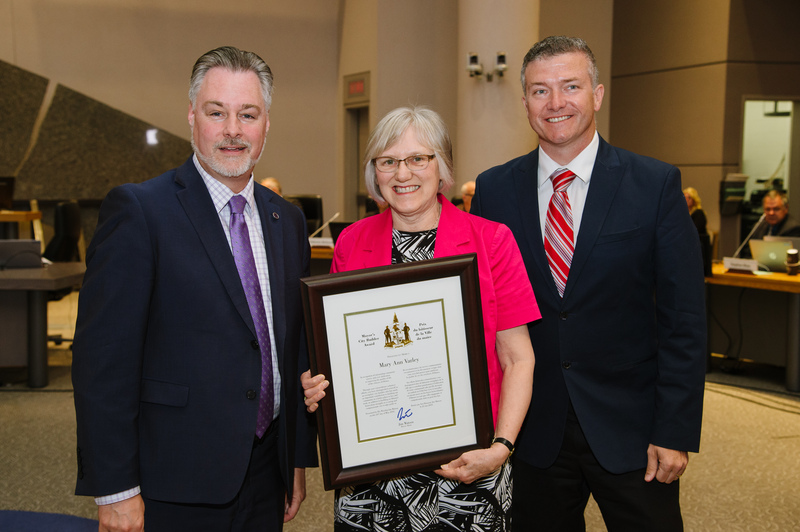 The City Builder Award was presented to her by Deputy Mayor Mark Taylor and Beacon Hill-Cyrville Councillor Tim Tierney on behalf of Mayor Jim Watson at yesterday’s Council meeting. Ms. Varley has volunteered with Arteast, a not-for-profit organization that helps its members develop their abilities and interests in the visual arts, in a variety of leadership positions. She has served as the President and Vice President of the organization, and now helps guide Arteast’s board and mentor other members. Arteast fosters the growth of visual arts in Ottawa and the surrounding regions. In support of the organization’s community outreach, Ms. Varley has led the Grow With Art speaker series since 2009, and supported other outreach activities and art exhibitions. A life-long artist that generously and selflessly gives her time, Ms. Varley is also an active member of the Ottawa Art Association.